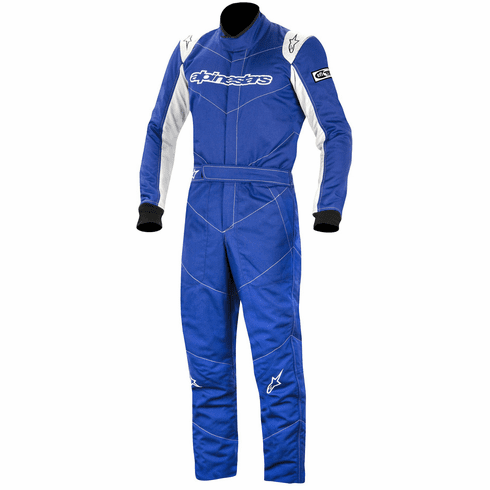 Alpinestars GP START auto race suit is an entry level suit designed for all forms of auto racing. The flat seam construction and pre‐curved sleeves and legs combine to offer exceptional comfort and fit when in the cockpit. The Alpinestars GP START suit features an advanced two‐layer fireproof construction with an outer shell in 100% Aramidic fiber for maximum heat transfer protection and an inner lining made of plush aramidic fiber. Pre‐curved sleeve and leg construction for superior fit in the driving position. The Alpinestars SP suit also features epaulettes with a clean, single panel design, an elasticized lower back for enhanced freedom of movement, a waist belt closure allowing a customized fit, and storage pockets for added convenience when you�re out of the cockpit. Boot cut legs with hidden Nomex inner cuff are standard on all Alpinestars GP START suits. SFI 3.2/5 and FIA 8856-2000 approved. SFI 3.2/5 and FIA 8856-2000 Approved.